When thirteen-year-old Sam Force boards his flight in Boston, he never imagines that the police will be waiting for him at the gate in Egypt. His Uncle Jasper’s gone missing and there’s a warrant out for his arrest. Now Sam is on a race against the police and the creepy guys who seem to be following him: he needs to find his uncle before they do. With the help of his new friend Mary and the mysterious taxi driver, Hadi, Sam follows the breadcrumbs Uncle Jasper left and discover a secret that’s been buried for years in the desert sands. 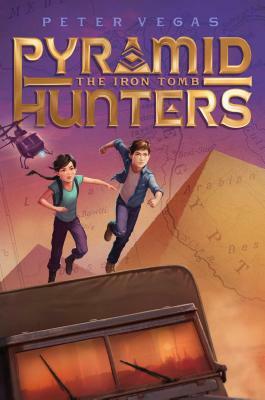 A fun, fast- paced first adventure in a new series that’s perfect for fans of Rick Riordan and Indiana Jones. When Sam Force goes to Egypt to spend the summer with his uncle Jasper, he’s ready for the usual vacation filled with museums and lessons about the pharaohs and ancient gods. Instead, Sam arrives at the airport and learns that his uncle is missing and wanted by the police. After narrowly escaping his own arrest, Sam sets off to find his uncle using the series of clues that Jasper left behind. But a group of mysterious men are hot on his trail, and Sam knows they’re willing to do whatever it takes to track down Jasper and whatever Jasper was looking for. With the help of his new friends Hadi and Mary, and by using the knowledge of ancient Egyptian history and culture that he once hated, Sam makes his way across Egypt determined to find his uncle. And if he does, if he finds Jasper before it’s too late, he may also uncover the secret of the Iron Tomb…a secret that could change Sam’s life forever.